Smoked Italian Porchetta Sandwich: Porchetta — pork loin wrapped in pork fat and smoked for eight hours — thinly sliced and topped with melted provolone cheese, lettuce, tomato, red onion, banana peppers, red wine vinaigrette and garlic aïoli on a toasted sub roll, $5.49. The Mount Italy Sandwich: Porchetta, thinly sliced smoked ham, salami and pepperoni with Italian seasoning, melted provolone, lettuce, tomato, red onion,banana peppers, red wine vinaigrette and garlic aïoli on a toasted star top roll, $6.99. Chicken Pepperoni Parm: Buttermilk fried chicken topped with mozzarella, roasted garlic marinara sauce and pepperoni on a star top bun $4.99. Availability: Nov. 12-15 at locations in the Michigan communities of Clio, Cedar Springs, Plainwell and Birch Run; Nov 25-28 in the Pennsylvania communities of Bethel Park, Bellevue, Leechburg and New Castle. 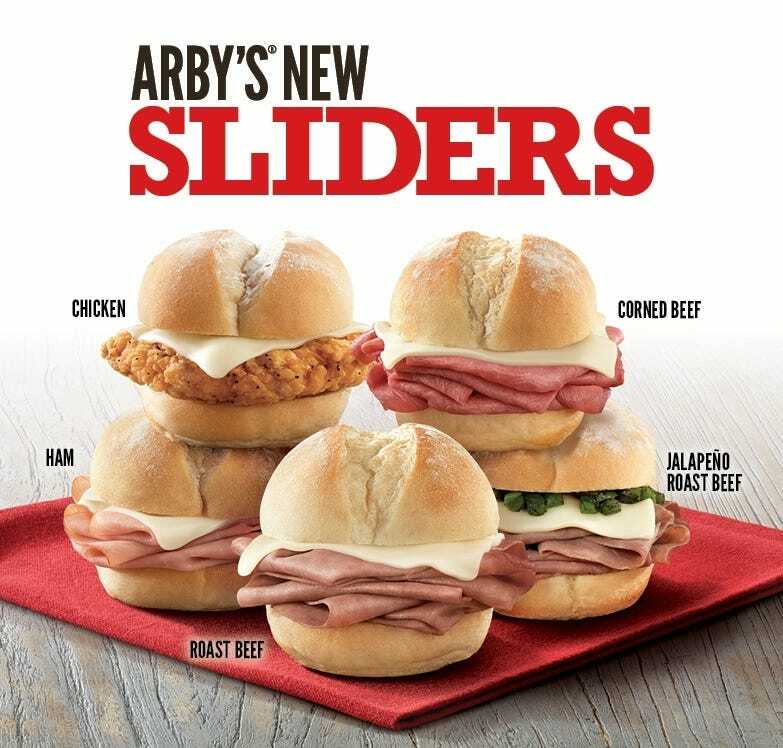 Arby’s has joined forces with sauce authority A.1. to deliver a steakhouse sandwich experience like no other. The new A.1. Special Reserve Steak Sandwich available at Arby’s features sliced USDA choice, top round, Black Angus steak, melted natural cheddar cheese and a crispy thick cut steakhouse onion ring lathered in A.1. Special Reserve sauce and crowned with a toasted star cut specialty roll. The A.1. Special Reserve steak sauce is exclusive to Arby’s and features a steak-friendly smoky, black pepper flavor profile. The A.1. Special Reserve Steak Sandwich is the latest innovation in Arby’s Angus Steak platform and joins the Angus Philly and Angus Three Cheese & Bacon on Arby’s menus nationwide. The Spicy Jalapeño Brisket Sandwich and Brisket Bacon Flatbread are available at Arby's for a limited time. Pumpkin Cheesecake Shake, a milkshake with a blend of pumpkin pie, cheesecake and pie crust flavors, plus molasses and vanilla extract, $2.89. Roast Beef ‘n Cheese Slider: Thinly sliced roast beef with melted Swiss cheese on a soft slider roll. Crispy Chicken ‘n Cheese Slider: A crispy chicken tender with melted Swiss cheese on a soft slider roll. Corned Beef ‘n Cheese Slider: Sliced corned beef with melted Swiss cheese on a soft slider roll. Ham ‘n Cheese Slider: Sliced ham with melted Swiss cheese on a soft slider roll. Jalapeno Roast Beef ‘n Cheese Slider: Thinly sliced roast beef with melted Swiss cheese and diced, fire roasted jalapenos on a soft slider roll. The Atlanta based sandwich QSR said that it sold 29 million sliders in its debut month of September. That’s about 1 million per day chainwide or about 300 per location per day. Arby’s is shaking things up with a delicious twist on their classic Reuben by introducing the new Rachel sandwich. The Rachel substitutes Reuben’s corned beef and sauerkraut for juicy turkey and house made coleslaw. While the Reuben is a standard option on the Arby’s menu, the Rachel is a limited time only offer (LTO) available throughout the month of March. Reuben – Marbled rye bread filled with freshly sliced corned beef, melty Swiss cheese, tangy sauerkraut and creamy Thousand Island dressing. Rachel – Thinly sliced roast turkey topped with big eye Swiss cheese, tangy house made coleslaw, Thousand Island dressing, served on toasted marble rye bread. Guests can enjoy either of these premium sandwiches at the suggested retail price of $4.99 per sandwich ($6.99 per meal); meals come with a choice of small curly fry or coleslaw as a side. For an enhanced experience guests also have the option of a Double-Stack version of these sandwiches for a suggested retail price of $5.99 per sandwich ($7.99 per meal). Crème Brulee Shake, custard shake with caramel swirl, topped with whipped cream and caramelized sugar bits, $2.89.